What an ending to such a beautiful, absorbing series. I’m so sad to leave Clary and her story behind, but so satisfied to look back on all that has happened in this 6 book journey! Firstly, I can’t believe I really didn’t feel the size of this book at all. At 650 pages, it’s quite a big one, but the pages flew by and I barely noticed it. The part that took me longest to read was actually the prologue, as we were suddenly introduced to new characters, Emma Carstairs and her story. However, I pushed on through and found I loved having Emma mentioned throughout the book. Due to her presence, I feel ready to go and read her story in The Dark Artifices. Due to the changing scenery, the pacing was excellent. The books contained so much emotion between different scenes and different characters, and over and over again I was faced with a sense of loss. I adore how Clare works with so many characters and I honestly believe it’s one of her greatest gifts. However, her writing greatly improves throughout The Mortal Instruments and I felt the difference here compared to City of Bones. I did find the plot a little predictable, as most of the books in this series follow a similar plot, but it was filled with enough small twists and surprises to keep me on my toes. I have to also praise Clare for the incredible extended magical world she created. I don’t feel like she’s writing too many books set in this universe, which considering how much she is writing, is crazy. Most worlds have their limits, but this one does really feel limitless. 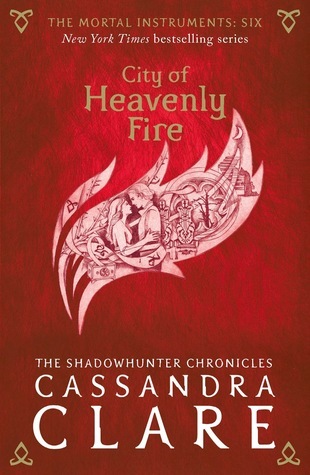 I’m so excited to continue with her books, including The Dark Artifices, The Bane Chronicles, Tales from the Shadowhunter Academy and many more as they are released! I cannot get enough of this world, and I adore how the characters are interlinked between the series in some small way, leaving me emotional reading mentions of characters from other series. Overall, what an incredible end to The Mortal Instruments, leaving me feel satisfied but also wanting more from this world.